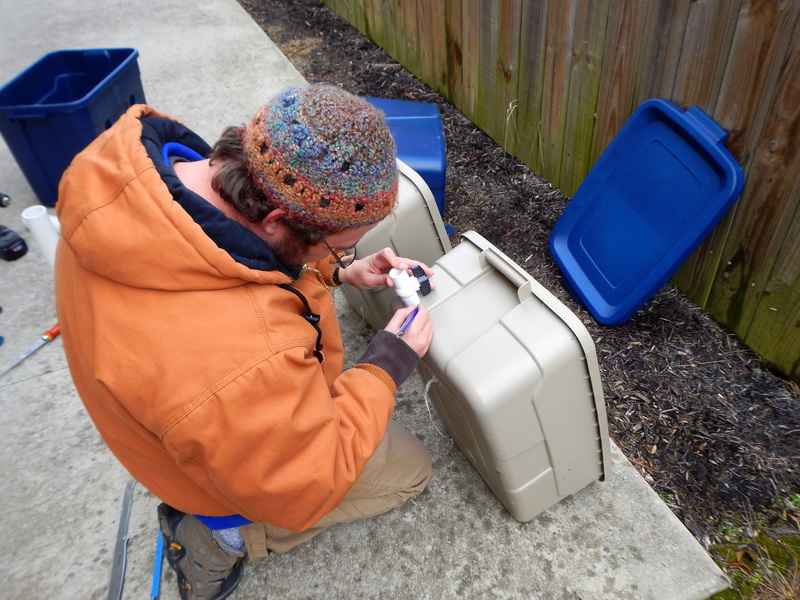 As part of a contract job, my WWOOF host Jonathan was requested to design and construct a worm bin composting system and to document the process for a blog post. Worms are excellent composters and soil builders; the worm castings they create (also known as vermicompost) are nutrient-dense and wonderful soil conditioners. In addition, the liquid “compost tea” that is produced can be drained from the bottom of the compost and is outstanding in its ability to suppress fungus as well as being a perfect low-strength fertilizer for seedlings. 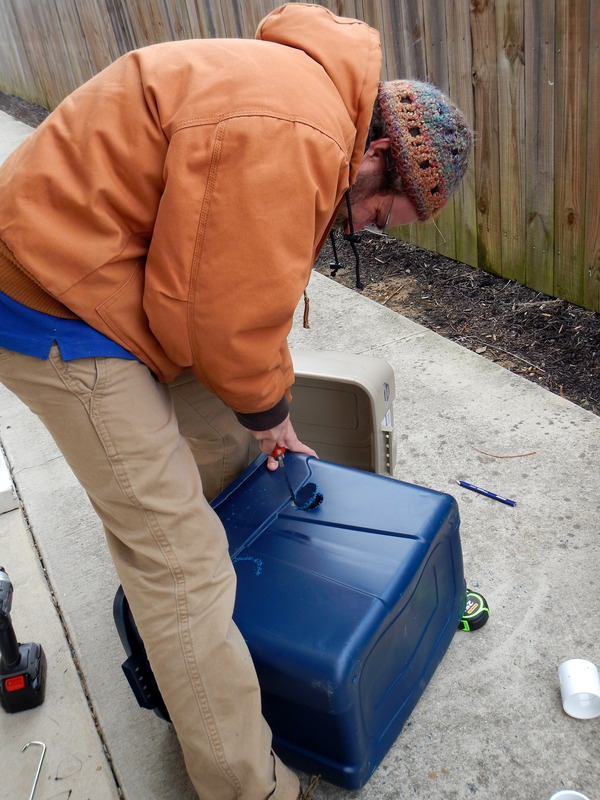 The small-scale worm bin system we constructed is perfect for composting kitchen scraps and can even be kept indoors. 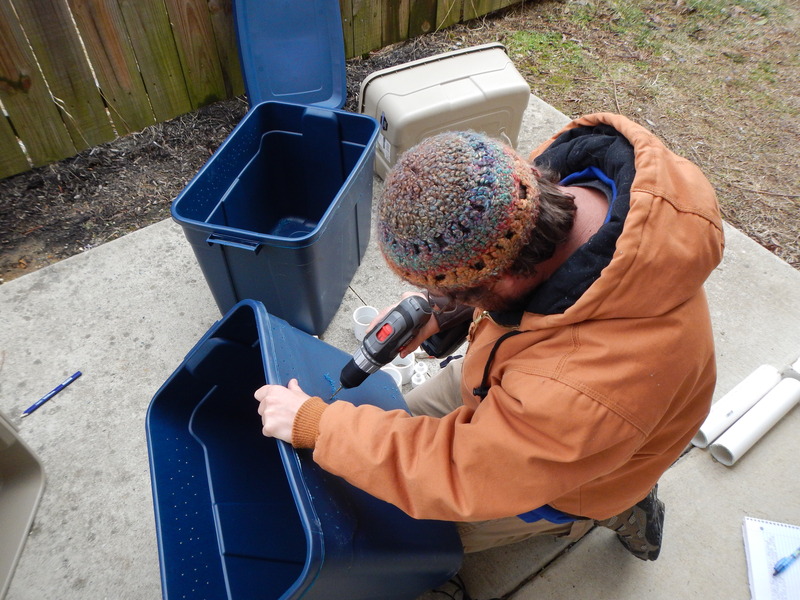 We built a two bin design in order to be able to easily harvest the compost out of one bin by drawing the worms to the other bin with food though a simpler one bin design is more common and may be more appropriate for households with fewer kitchen scraps. 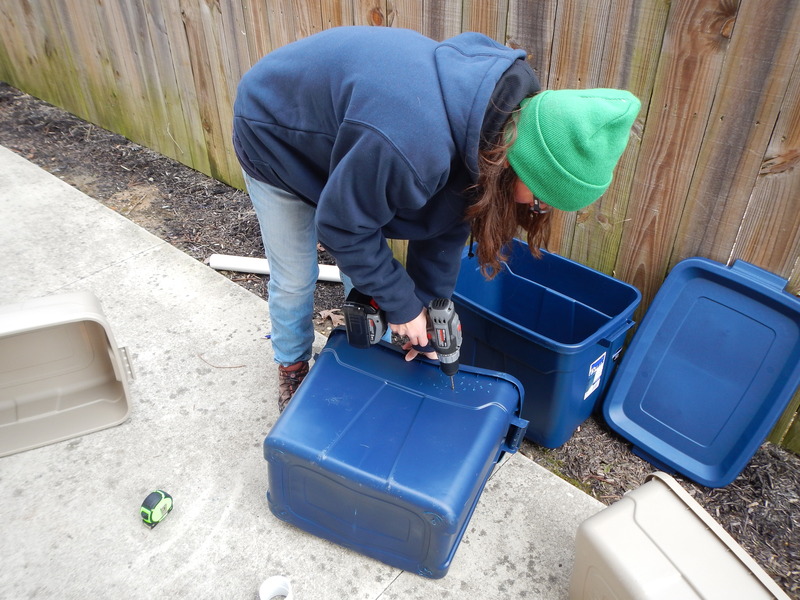 Also to be noted is that because we were creating a demo model we used all new materials but that it is entirely possible to build a worm bin using reused material. 1. 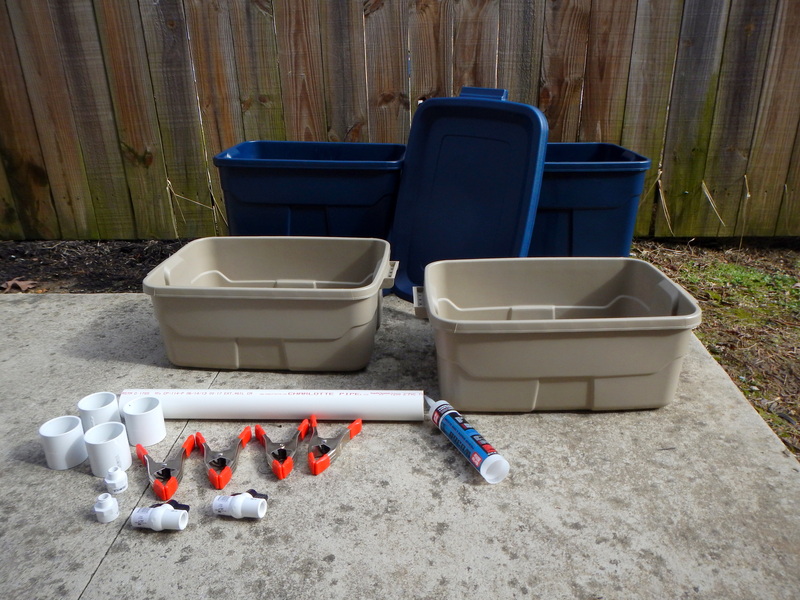 Start by placing one end of the PVC against the long side of the larger 18 gallon tub, at least 4-6 inches from the top and off to one side. 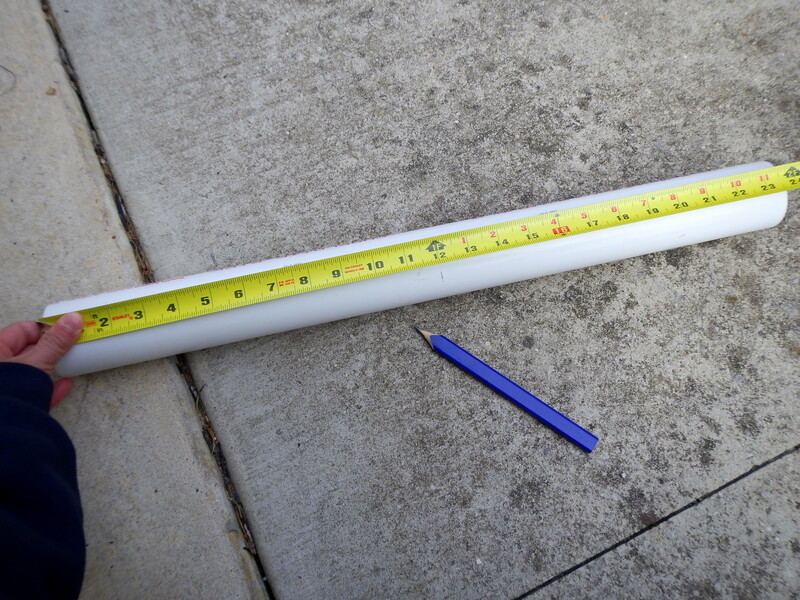 Trace the circle of the end of the PVC with your pencil and on the other side of the center line so that the tub has two circles on one side that are level with each other and approximately equidistant to the sides. Repeat with the other larger tub, marking the circles at the same height and distance from the sides as the other tub so that when the PVC connects them they will be even. 2. 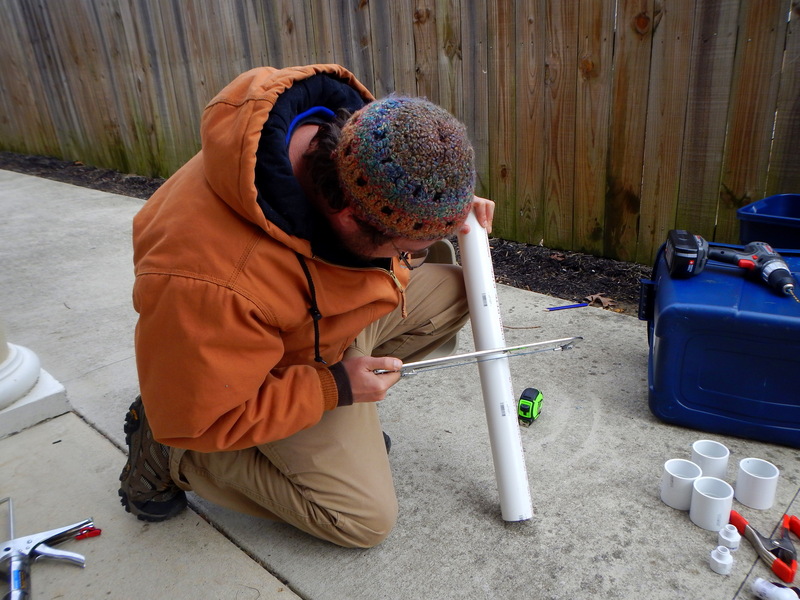 Using the measuring tape, mark the exact center of the PVC pipe with a pencil, then cut the PVC along the line with a hacksaw. 3. 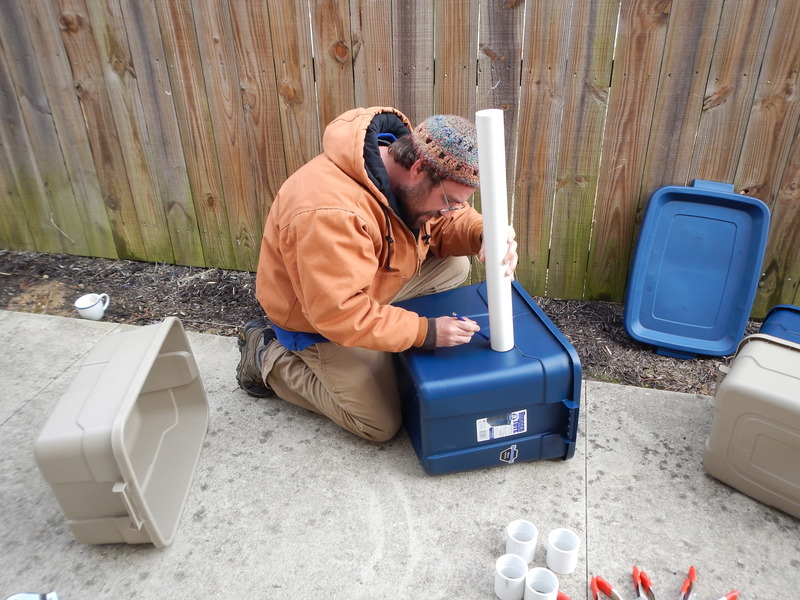 With the 1/8 inch bit, drill approximately 20 holes approximately 1 inch apart along the top of the long side of each of the larger 18 gallon tubs above the holes traced around the PVC pipe. Pick off extra bits of plastic so they do not get into your compost. These holes will serve as aeration for the worms but are too small for the worms, which need a 1/4 inch of space, to fit through. 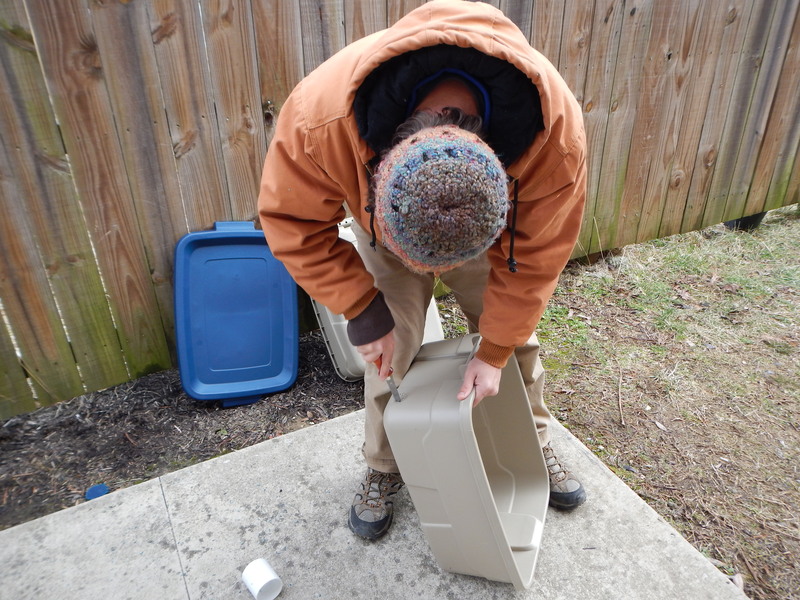 These holes are also placed above the holes for PVC because the compost should not be allowed to rise higher than PVC pipe connections which allow the worms to travel back and forth between the tubs. 4. Still using the 1/8 inch bit, drill closely-spaced holes along the outline of the circle just inside the lines for each of the 4 traced circles. 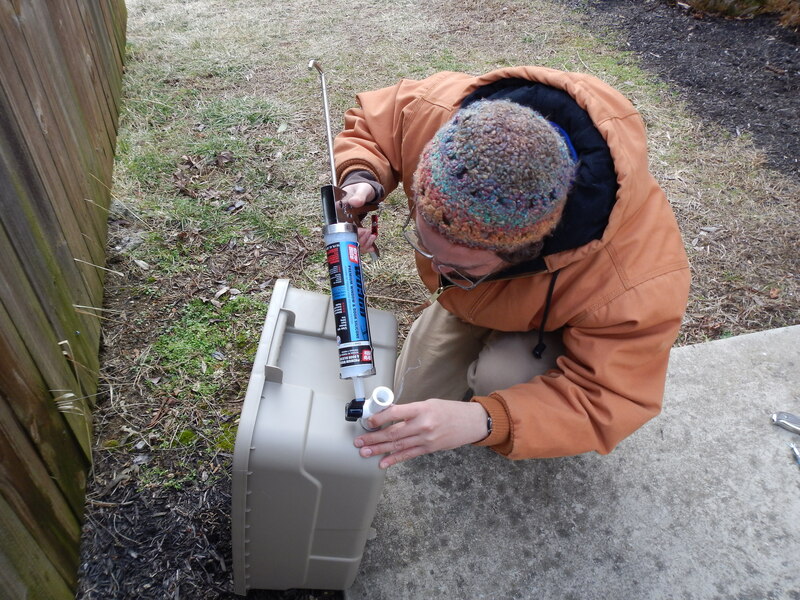 Do not drill right on the line as it may result in space around the PVC pipe. Then cut away the circles using the keyhole saw. 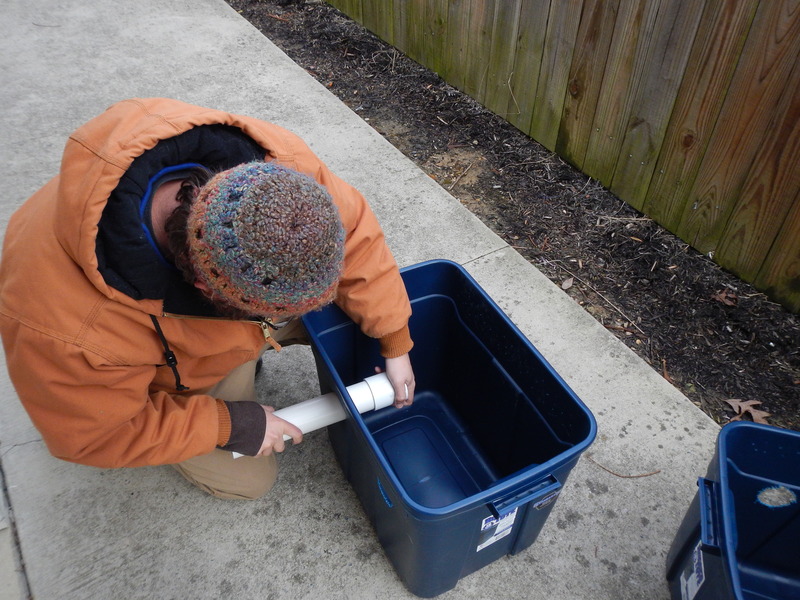 Make sure your PVC fits snuggly in each of the four holes without bending the plastic of the tub. Again, pick off extra bits of plastic so they do not get into your compost. 5. 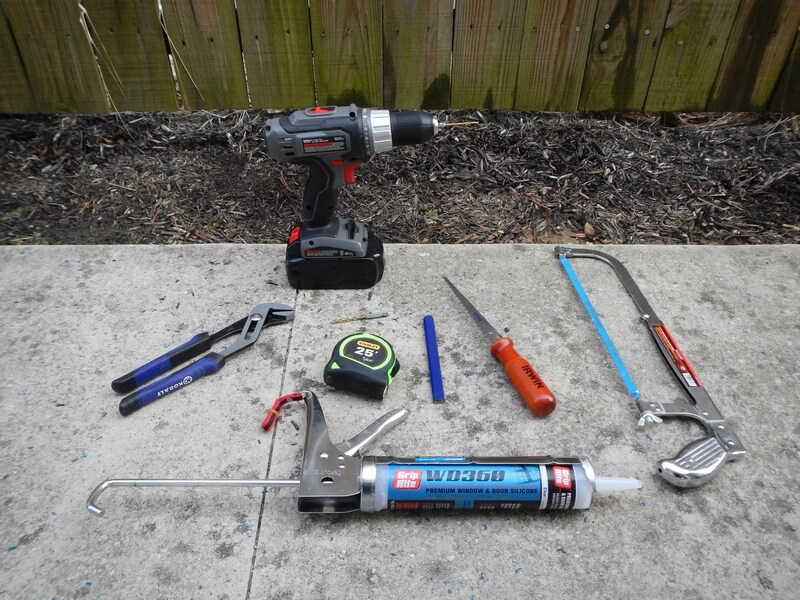 Drill with the 3/16 inch bit approximately 35 holes along the perimeter of the bottom of each of the larger 18 gallon tubs, below the lip, and about 1-2 inches apart. It is important to drill the holes below the lip so that it effectively drains the liquid as it collects on the bottom of the tub. 6. Trace the outline of the threaded spigots on the outside bottom corner of the short side of one of the smaller 10-gallon tubs. This will allow you to drain the valuable liquid compost from the worm bins so make sure the holes for the spigots are not placed too tight. 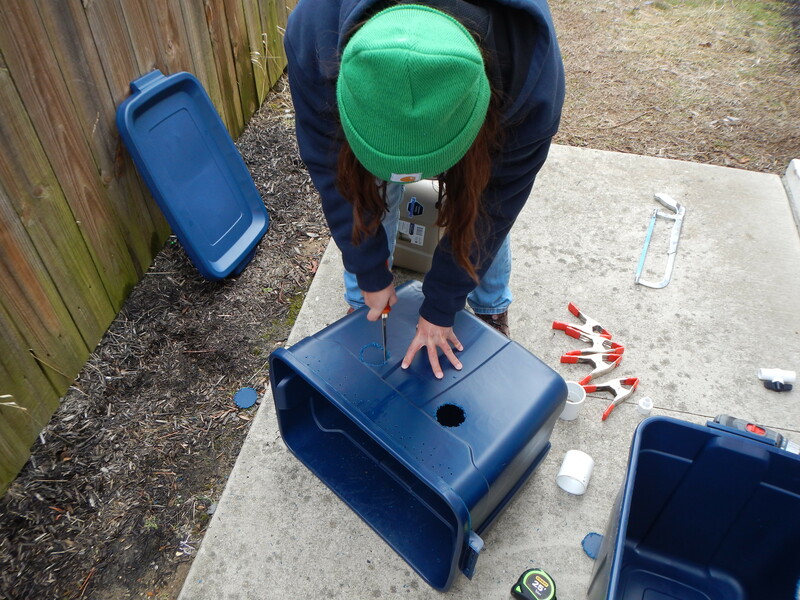 Repeat the marking of the outline on the other smaller tub but on the opposite bottom corner so that the spigots will be located on the outside corners of the assembled worm bin. 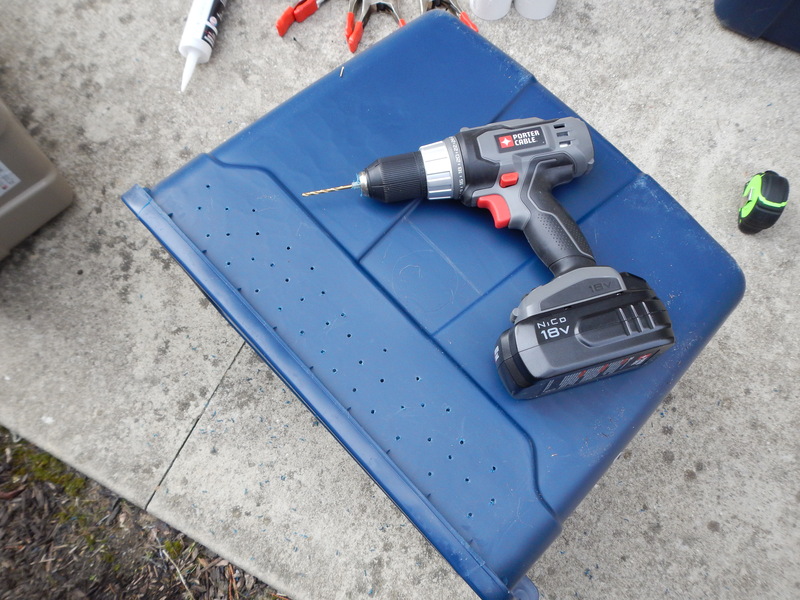 Repeat the drilling procedure with the 1/8 inch bit used to create the holes for the PVC and then cut the holes away using the hacksaw. 7. 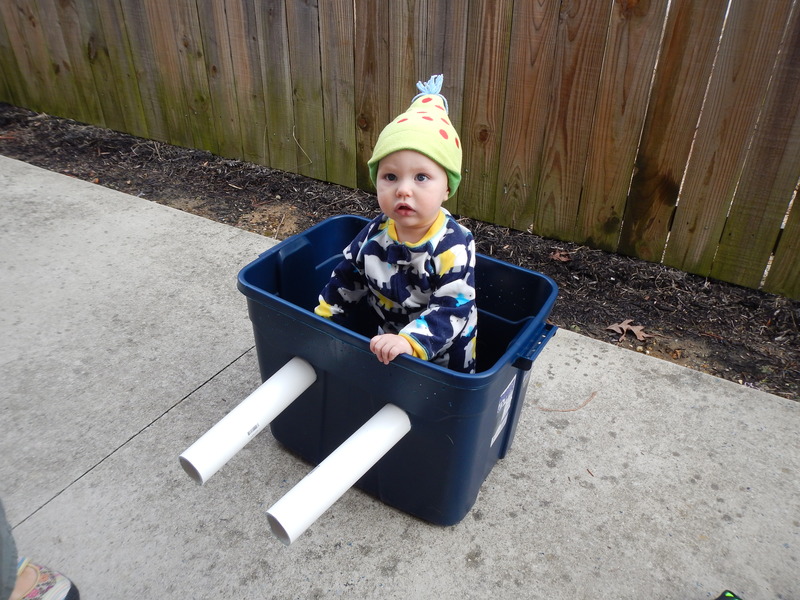 Place a small child in one of the tubs. 8. 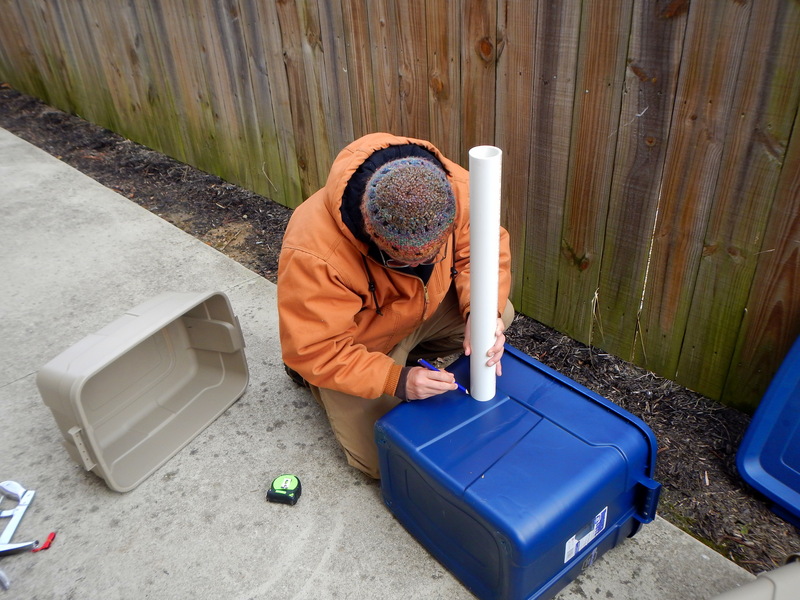 Returning to the larger tubs, place a 1 foot length of cut PVC in one of the holes and fit a collar over the end that is inside the bin. Making sure the collar is fit securely, pull the PVC back out of the tub as far as possible so that the collar lies flush with the inside wall of the tub. 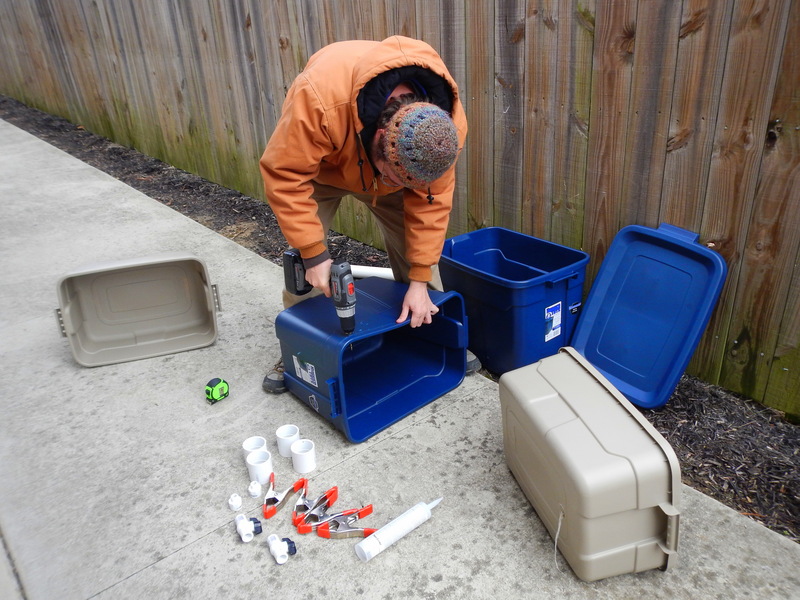 Repeat fitting the other length of PVC for the other hole on the same bin then insert both the opposite ends of the PVC into the other tub one at a time. Repeat the procedure fitting the collars so that the PVC connects both tubs with all four collars sitting snug against the insides of the tubs. 9. Place one of the spigots on the outer side of the hole cut in one of the smaller tubs and thread the male adapter into it from the inside of the tub. 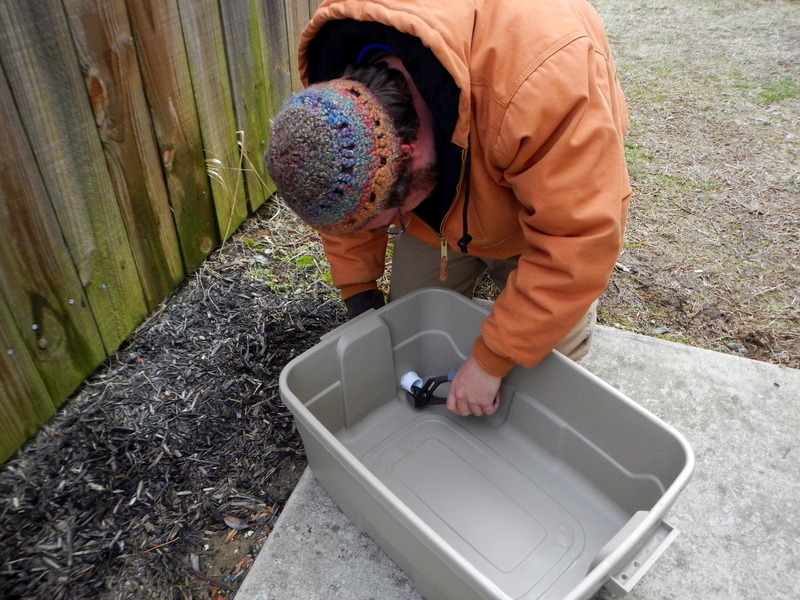 Using a wrench, tighten the adapter so that the spigot and the adapter lay almost flush on the inside and outside of the tub. 10. 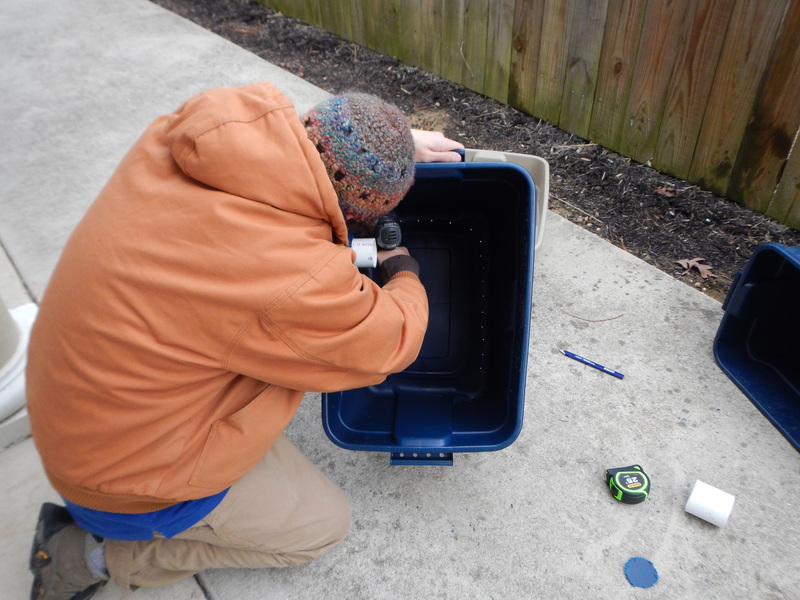 Using the caulk gun, seal the outline of the spigot on the outside of the tub. 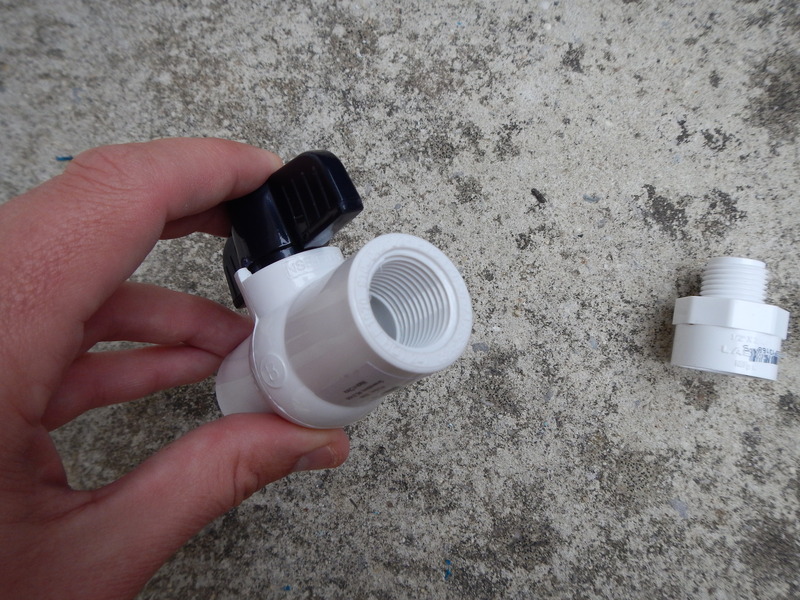 Finish tightening the male adapter and spigot before the caulk dries to ensure it will be waterproof. 11. 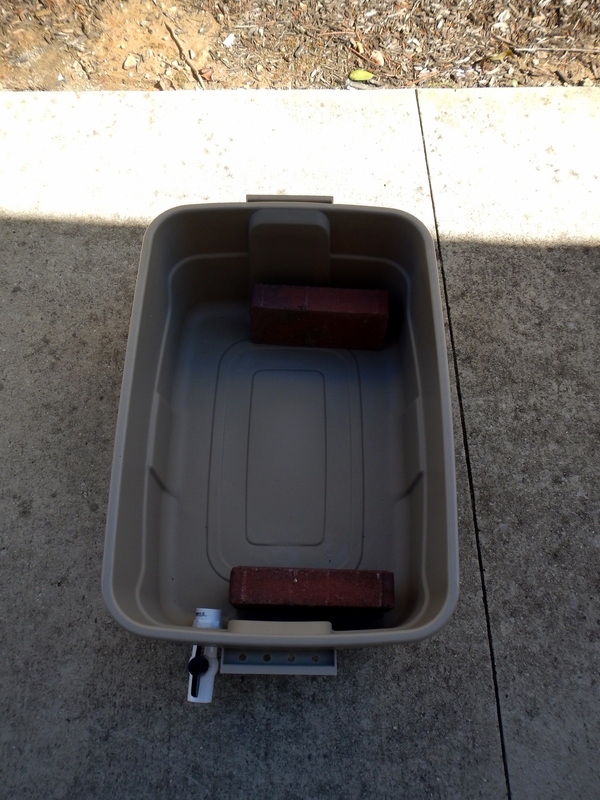 Place two bricks in the bottom of each of the smaller 10 gallon tubs, away from the spigot hole. This will raise the level of the larger tubs allowing space for liquid compost to collect. 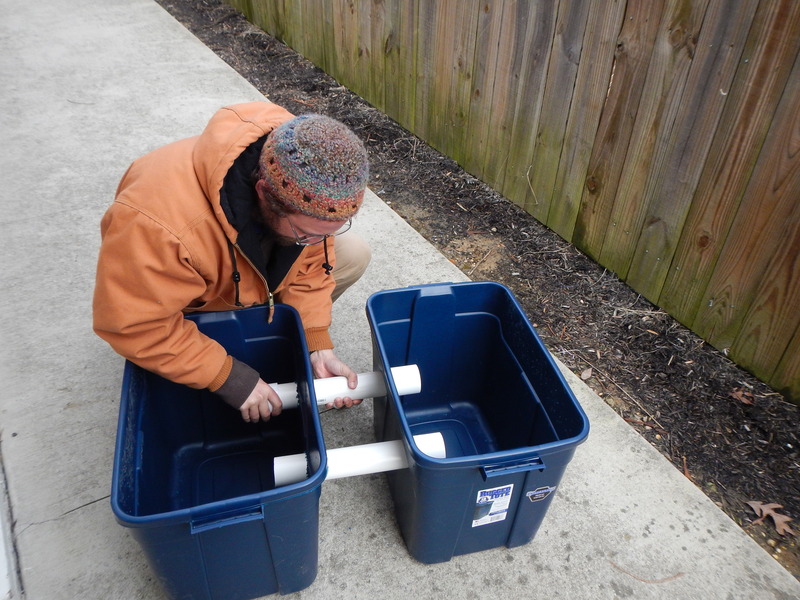 Position the smaller tubs, then place the PVC-connected larger tubs inside the smaller tubs on top of the bricks. 12. 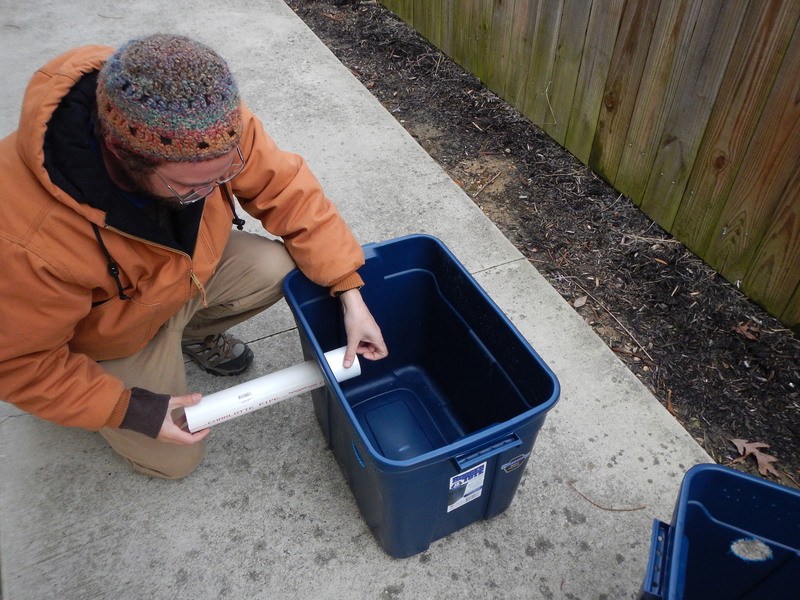 The last step is to fill the tubs with compostable material and the worms. 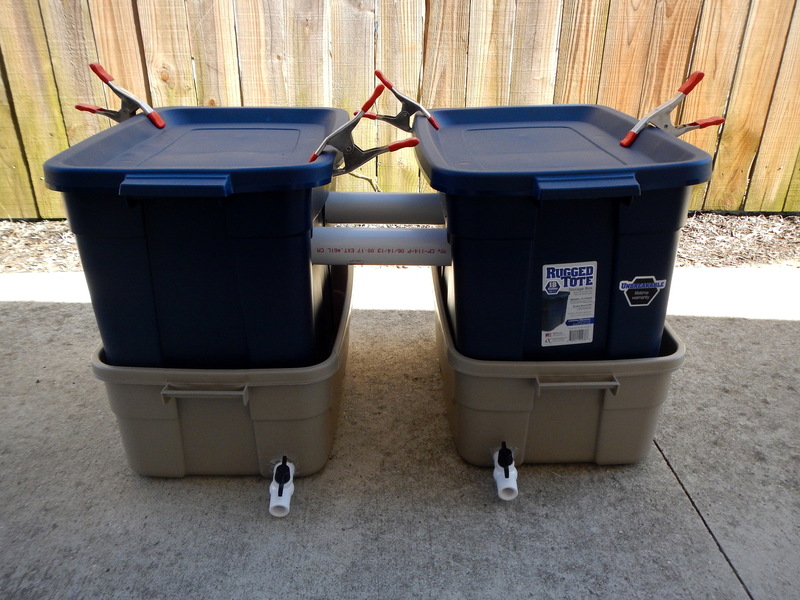 Then fit the lids on top of the larger bins and clamp the two opposite corners on each bin in order to prevent worms from escaping as well as protect the compost from animals and weather if the tubs are kept outside. 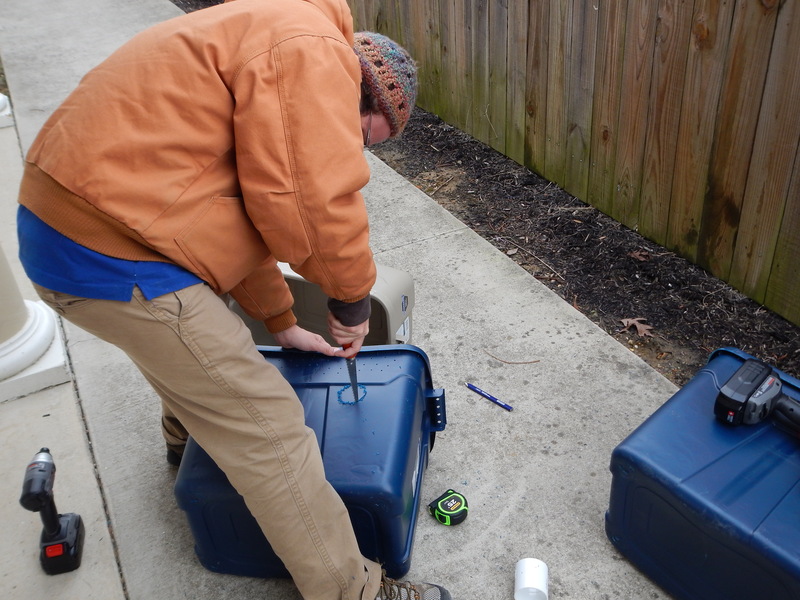 We built the system in the first week of February but have yet to start the time-lapse documentation of the composting process so I will have to update you all on that in the future. As soon as we start filling our bins and adding worms I will add new pictures and provide explanations but for those who may be eager to start their vermicompost, you can start by adding about four inches of moist, pre-soaked newspaper cut into strips along with some leaves or dirt. Food should be added slowly as worms begin multiplying and be placed in different areas of the bin(s) each day. Keep your worms on a vegetarian diet; meat, dairy, and fats should be avoided. The worms themselves can be found at bait shops or collected by placing a large, wet piece of cardboard on your lawn overnight. Below are a couple photos of me working on the bins. Don’t mind the fifty layers – it was below freezing that morning! Yes. A millions times yes, and we are working on one now! Where did you find this sturdy spigot? 2 of mine have broken! We found this spigot in the plumbing section of Lowes along with the PVC. I think you’d have luck finding it at any major hardware store.